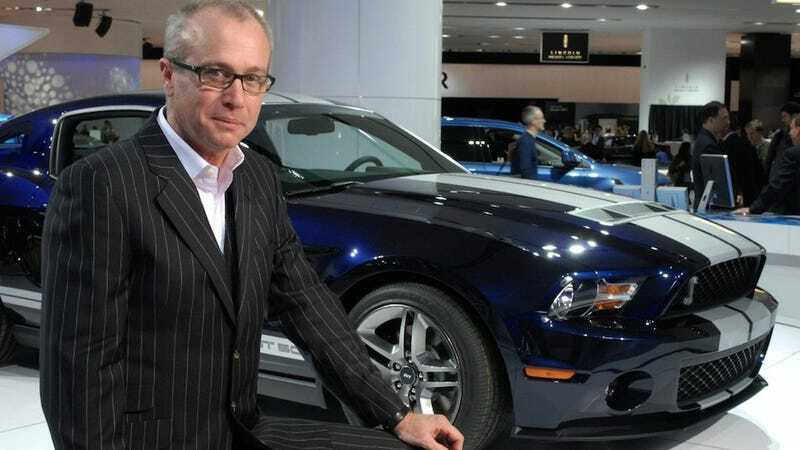 Ford Motor Company announced this week that top designer J Mays is retiring. In his 33-year career and 16-year tenure at Ford, Mays ushered in the era of retrofuturistic styling that other car companies scrambled to follow. Here, we look back at five of his vehicles that steered the shape of automotive design. Audi Avus Quattro concept car, 1991: Mays started his design career at Audi and, after a brief stint at BMW, returned to the company as a senior designer. This concept, a flight of fancy not intended for production, melded swoopy supercar looks with design elements inspired by Audi's sleek Silver Arrow race cars of the 1930s. Elements of this design echoed through Audi's production vehicles for years to come — especially the rounded-off-rectangle headlights and six-spoke wheels. Volkswagen New Beetle, 1998: In 1989, Mays was promoted to chief US designer for Volkswagen, Audi's parent company. His 1994 Concept 1 design experiment was a modernized look at the classic Volkswagen Beetle, and its debut at the North American International Auto Show drew huge crowds. VW saw an opportunity, and turned the concept into a production car. It sold like crazy. The era of retrofuturistic car design was born. Ford Thunderbird, 2002: Mays joined Ford Motor Company in 1997, and helped create Ford's design language for the 2000s. The 2002 Thunderbird drew heavily from the original 1955 design. While the car wasn't a sales success, the design was universally loved as a modern take on a jet-age icon. 2004 Ford GT: Penned by Camilo Pardo under Mays' guidance, the GT evoked the late-1960s Ford race cars that dominated Ferrari and others at Le Mans. This retro supercar was a halo vehicle — one that very few could afford, but that let Ford flex its design and engineering muscles in a way that built enthusiasm for its more run-of-the-mill offerings. 2005 Ford Mustang: One of America's most iconic names. Mays summed up the challenge of redesigning it: "[M]y biggest nightmare, the thing that made me wake up at night in a cold sweat, was you don't want to be known as the guy that screwed up the Mustang." Drawing heavily from the 1967 design made famous by Steve McQueen's movie "Bullitt", Mays' team created a hit that resonated with classic car fans and young car buyers alike. By this time, the retro theme was in full swing, and other carmakers had jumped on the trend. Cars like the Porsche Boxster, BMW Z8, Chevy SSR, Chrysler PT Cruiser, and the entire MINI line use Mays' trick of putting a modern spin on a classic design. Even today, cars like the Dodge Challenger, Chevy Camaro and Fiat 500 all use designs inspired by their companys' history books — and by the success of Mays' nostalgic work at VW and Ford. Not all of Mays' designs looked so longingly at the past: the new Ford Fusion is an excellent example of futuristic design unfettered by tradition. But Mays will be most remembered for kicking off the retrofuturistic movement that still influences car styling today.